I've seen this tag going around on lots of beauty blogs recently, and although I haven't actually been tagged, I decided to bring it to the book blogging corner of the Internet. So, here we are! 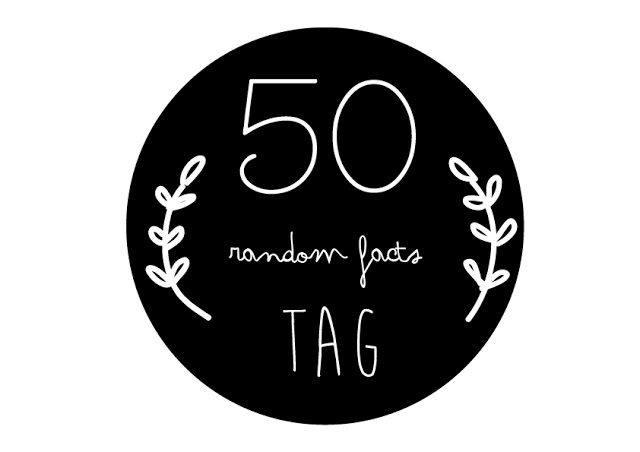 It may seem simple; just write 50 facts about yourself, yeah? But it's actually quite hard. I'm British but I hate tea and I don't look like Emma Watson. Shocking, right? Sour Cream and Onion Pringles take up 99% of my diet. I am a perfectionist. I will spend hours over something to make it perfect and, if it isn't perfect, I'll get really stressed. I'm one of the biggest fangirls you will ever meet! I'm really sarcastic, like Jace from The Mortal Instruments...ehem. My favourite YouTubers are Emma Blackery, Cherry Wallis, Cimorelli, charlieissocoollike, danisnotonfire, Amazing Phil, MacBarbie07, StilaBabe09, BeautyBySiena, Jack and Finn, LukeIsNotSexy, Jenna Marbles, Catrific, Zoella, Alex Day, Carrie Hope Fletcher, Michelle Phan, Ryan Beatty, Megan and Liz, Christina Grimmie and Daily Grace. There's this thing, I can't remember what it's called but it's basically Dyslexia with numbers and I think I have it. I find making graphics really fun, so, if you want me to make you one then just let me know. I haven't seen the City of Bones movie yet but I REALLY hope they film City of Ashes! This is taking way longer than I thought it would. As you may have guessed by my last fact, I play guitar. I also play piano. I really like dance, but I haven't done it as an extra curricular since I was 7, so I never really got a chance to pursue it as more than just a hobby. I used to be a cheerleader and I came 3rd in Nationals and 2nd in Regionals. Yaaay. I really enjoy photography! Must. Get. A. Tripod. I've been using a computer since I was 2 years old. ...Is the date of my birthday. I use Twitter far too much. CATCHING. FIRE. IS. OUT. IN. NOVEMBER. That's not even a fact about me but OMG. For my IGCSEs I'm taking Business Studies, Childcare, History and Geography, along with the core subjects. I'm half French and apparently I descend from Irish people. Does that make me...Frishlish? What an awesome word I just created. I've only ever met one author (Cathy Cassidy) but several times. She's lovely, by the way! I'm a Shadowhunter. Don't know what that means? Silly little Mundane. I'm a Witch at Hogwarts. Don't know what that means? Silly little Muggle. I got all A*s in my End of Y9 Exams which was unexpected. o.O Still can't believe it. I like making other people happy. In 10 years me, Sophie and Rita are going to the Library Hotel in NYC whilst we attend BEA. Yep. #IWish. I say ASDFGHJKL a lot. It's practically my motto. ONLY ONE FACT LEFT OMG WHAT DO I SAY THIS IS LIKE TRYING TO PICK ONE THING TO WISH FOR. I will be doing this, have no idea who I'll tag but I will be doing this. I think there will be some Twitter Ukulele lessons at some point in the future. Yes. Plan. 8) Is Discalculia. I agree with you on 31. Amazing post (apart from the hating One Direction.. I think I'll just ignore that). Thank you for tagging me, Amber! This is a tag I'm definitely going to do - and sadly, I really LOVE tea and am British! I will forever be nagging you for Graphics! This was such fun to read! You're welcome! Hehe I don't understand why most British people love tea so much. :D Thanks Sophie!